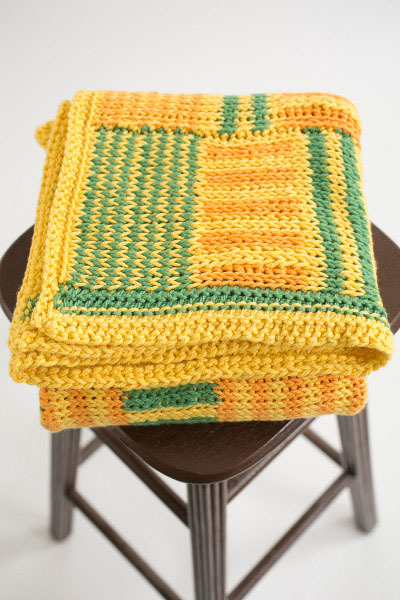 Inspired by the classic rail fence quliting block, this colorful blanket is so thick, it can double as a play mat. The bright and cheerful hues are gender-neutral and will please traditional and modern parents alike. 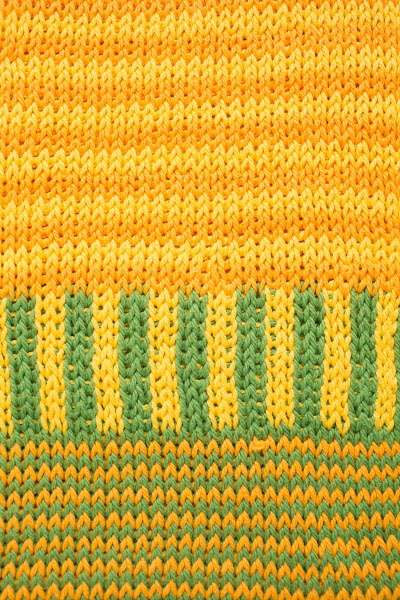 Tunisian Knit Stitch (Tks): Insert hook from front to back through center of next vertical bar, yo, draw up a loop, leave st on hook. Tunisian Purl Stitch (Tps): Bring yarn to front, insert hook under next vertical bar, yo, draw up a loop, leave st on hook. Joining Base Row: Sk first ch, *insert hook in next ch, yo, draw up a loop, leave st on hook. Rep from * across row to last ch, insert hook in last ch and through first Tks on previous panel, yo, draw through ch and Tks, leave st on hook. Return Pass: Do not turn. Ch 1, *yo, draw through 2 loops. Rep from * across row. 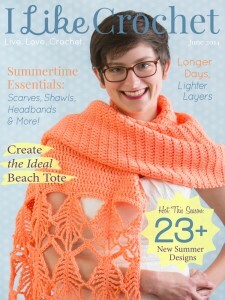 Each Tunisian crochet row includes a forward and return pass. Always skip first vertical bar (underneath loop on hook) on each row. For horizontal stripes, change color at the end of return pass. With 2 loops remaining, yo with new color, draw through 2 loops. Carry previous color along side of row. For vertical stripes, loosely float the unused color across the back of your stitches. Use bobbins for CB and CC. For even “chain” edges, on last Tks of row, insert hook into both loops. Row 1: Sk first ch, *insert hook in next ch, yo, draw up a loop, leave st on hook. Rep from * across. Work return pass, changing to CC with last yo. Row 2: Tks in each st across row. Work return pass, changing to CA with last yo. Row 3: Tks in each st across row. Work return pass, changing to CC with last yo. Rows 4-13: Repeat Rows 2-3 5 times. Row 14: Repeat Row 2. Fasten off CC. Row 15: Tks in each st across row. Work return pass. Row 16: With CA, Tks in next st; with CB, Tks in each of next 2 sts; *with CA, Tks in each of next 2 sts, with CB, Tks in each of next 2 sts. Rep from * across row. Do not turn. With CB, ch 1, yo, draw through 2 loops; with CA, (yo, draw through 2 loops) twice; *with CB, (yo, draw through 2 loops) twice; with CA, (yo, draw through 2 loops) twice. Rep from * across row. Rows 17-25: Repeat Row 16 nine times. Fasten off CB. Row 26: Rep Row 15. Row 27: Rep Row 3. Row 28: Rep Row 15. Row 29: Rep Row 2. Rows 30-33: Rep Rows 26-29. Fasten off CC. Rows 34-35: Rep Row 15 twice. Rows 36-115: Rep Rows 16-35 4 more times. Rows 116-124: Rep Rows 16-25 once. Row 126: Rep Row 3. Rows 127-136: Rep Rows 2-3 5 times. Row 137: Rep Row 2. Row 138: Rep Row 15. Row 139: *Insert hook in next st as for Tks, yo and draw through both loops on hook. Rep from * across row. Fasten off. Row 1: Work Tunisian joining base row. Work return pass, changing to CB with last yo. Row 2: Tks in each st across row until last st, insert hook in last st and through first Tks on previous panel, yo and draw through both sts and leave st on hook. Work return pass, changing to CA with last yo. Row 3: Tks in each st across row until last st, insert hook in last st and through first Tks on previous panel, yo and draw through both sts and leave st on hook. Work return pass, changing to CB with last yo. Rows 4-13: Rep Rows 2-3 5 times. Row 14: Rep Row 2. Fasten off CB. Row 15: Tks in each st across row until last st, insert hook in last st and through first Tks on previous panel, yo and draw through both sts and leave st on hook. Work return pass. Row 16: Rep Row 15. Row 17: Tks in each st across row until last st, insert hook in last st and through first Tks on previous panel, yo and draw through both sts and leave st on hook. Work return pass, changing to CC with last yo. Row 18: Rep Row 15. Row 19: Rep Row 2. Rows 20-23: Rep Rows 16-19. Fasten off CC. Rows 24-25: Rep Row 15 twice. Row 26: With CA, Tks in next st; with CB, Tks in each of next 2 sts; *with CA, Tks in each of next 2 sts; with CB, Tks in each of next 2 sts. Rep from * across row until last st. until last st, insert hook in last st and through first Tks on previous panel, yo and draw through both sts and leave st on hook. Do not turn. With CB, ch 1, yo, draw through 2 loops; with CA, (yo, draw through 2 loops) twice; *with CB, (yo, draw through 2 loops) twice; with CA, (yo, draw through 2 loops) twice. Rep from * across row. Row 27-35: Rep Row 26 9 times. Fasten off CB. Rows 36-115: Rep Rows 16-35 four more times. Rows 127-136: Rep Rows 2-3 five times. Row 139: *Insert hook in next st as for Tks, yo and draw through both loops on hook. Rep from * across row to last st, insert hook in next st and through first Tks on previous panel as for Tks, yo and draw through both loops on hook. Fasten off. Row 2: Tks in each st across row until last st, insert hook in last st and through first Tks on previous panel, yo and draw through both sts and leave st on hook. Work return pass, changing to CC with last yo. Rows 4-13: Rep Rows 2 & 3 five times. Row 14: Repeat Row 2. Fasten off CB. Row 16: With CC, Tks in next st; with CA, Tks in each of next 2 sts; *with CC, Tks in each of next 2 sts; with CA, Tks in each of next 2 sts. Rep from * across row until last st. until last st, insert hook in last st and through first Tks on previous panel, yo and draw through both sts and leave st on hook. Do not turn. With CA, ch 1, yo, draw through 2 loops; with CC, (yo, draw through 2 loops) twice; *with CA, (yo, draw through 2 loops) twice; with CC, (yo, draw through 2 loops) twice. Rep from * across row. Rows 17-24: Rep Row 16 eight times. Row 25: Repeat Row 16 and return pass across to last 2 loops, changing to CB with last yo. Row 27: Tks in each st across row until last st, insert hook in last st and through first Tks on previous panel, yo and draw through both sts and leave st on hook. Work return pass, changing to CA with last yo. Row 29: Rep Row 3. Rows 30-53: Repeat Rows 26-29 six times. Fasten off CA. Row 54: Repeat Row 15. Row 55: Rep Row 2. Rows 56-65: Rep Rows 16-25 once. Rows 66-73: Rep Rows 26-29 twice. Row 74: Rep Row 15. Row 75: Rep Row 2. Rows 76-85: Rep Rows 16-25 once. Rows 86-115: Rep Rows 26-55 once. Rows 116-125: Rep Row 16 ten times. Row 1: Work Tunisian joining base row. Work return pass, changing to CC with last yo. Row 3: Tks in each st across row until last st, insert hook in last st and through first Tks on previous panel, yo and draw through both sts and leave st on hook. Work return pass, changing to CC with last yo. Rows 4-13: Rep Rows 2-3 five times. Row 14: Rep Row 2. Fasten off CC. Rows 20-23: Rep Rows 16-19. Fasten off CB. Rows 24-25: Rep Row 16 twice. Row 26: With CA, Tks in next st; with CC, Tks in each of next 2 sts; *with CA, Tks in each of next 2 sts; with CC, Tks in each of next 2 sts. Rep from * across row until last st. until last st, insert hook in last st and through first Tks on previous panel, yo and draw through both sts and leave st on hook. Do not turn. With CC, ch 1, yo, draw through 2 loops; with CA, (yo, draw through 2 loops) twice; *with CC, (yo, draw through 2 loops) twice; with CA, (yo, draw through 2 loops) twice. Rep from * across row. Rows 27-35: Rep Row 26 nine times. Fasten off CC. Starting at side of Row 1 in lower corner of Fourth Panel, with CC, *insert hook in BL of next st, yo and draw up a loop, leave st on hook. Rep from * across row, ending in sl st loop of Row 139. Work return pass. Row 1: Tps in ea st across row. Work return pass, changing to CA with last yo. Fasten off CC. Row 2: Tps in each st across row. Work return pass. Row 4: *Bring yarn to front front, insert hook in next st as for Tps, yo and draw up a loop, yo and draw through both loops on hook. Rep from * across row. Fasten off. Starting at side of Row 139 in upper corner of First Panel, repeat pattern for Short Side 1 through Rnd 4, do no fasten off, 3 sc in corner st.
Foundation Row: Turn, working along bottom edge of blanket, *insert hook in BL of next st, yo and draw up a loop, leave st on hook. Rep from * across row. Work return pass. Row 1: *Bring yarn to front front, insert hook in next st as for Tps, yo and draw up a loop, yo and draw through both loops on hook. Rep from * across row. 2 sc in last st. Join with sl st to side. Fasten off. With CA, working along top of blanket, 2 sc in corner. Foundation Row: *Insert hook in BL of next st, yo and draw up a loop, leave st on hook. Rep from * across row. Work return pass. *Bring yarn to front front, insert hook in next st as for Tps, yo and draw up a loop, yo and draw through both loops on hook. Rep from * across row. 2 sc in last st. Join with sl st to side. Fasten off. With tapestry needle, weave in ends. Wet block to measurements. I’m trying to get my yarn stash under control. What is the best way to organize it all?